He spun that off in any weird directions talking about all sorts of things and even discussing a paired clip from John Boorman's POINT BLANK with Buster Keaton's THE NAVIGATOR. This allowed Jarmusch to gush about Keaton. There was lots of name dropping, talking about hanging out with Nicholas Ray and especially Samuel Fuller. He even explained the whiplash an audience once got listening to him interview Martin Scorsese as they went from Marty's fast pace speech to Jarmusch's slow cadence. 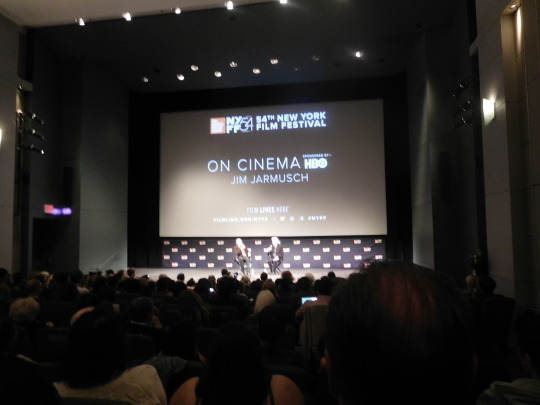 I don't remember much else, at least to reconstruct narrative, but it ended with a clip from SWORD OF DOOM and Jarmusch telling how he used the film to quit smoking. He essentially stayed alone in his house and watched the film several times a day for to weeks to get over the craving. And Nate and I met a lovely couple from Canberra Australia who stumbled on the festival and are having a blast seeing films. 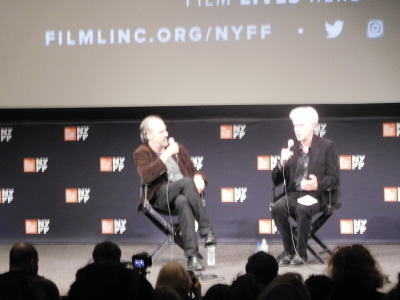 So far they did GIMME DANGER and the Jarmusch talk. Next up maybe NERUDA. If you see them wandering the halls do stop and say hi, they are lovely people. And if you are reading this the record shop I was thinking about was House of Oldies at 35 Carmine St. Also try Bleecker Street Records which moved to 188 West 4th Street, which is a couple of blocks away.